The action starts early Saturday morning, 7:30 am at Cawley Stadium in Lowell. To find out what I'm talking about, check out what I already wrote about this excellent event or go to the event's Web site. I'll see you on Saturday! So, David Ortiz (and Manny Ramirez, but that's no surprise anymore) tested positive for steroids in 2003...evidently. Forget about the furor over tainted titles and rancid role models. Almost everybody in sports cheats somehow at some point, to say the least. What I find funny about this non-fiasco is that, aside from the fact that this is the best day Dan Shaugnessy has had in six years, nobody outside of Boston and New York really cares about this story. But you wouldn't know that living in Boston right now. Oh, sure, Papi's on the front page of ESPN.com. That makes sense. What on earth else is ESPN going to write about in late July, anyway? And I get the fact that local newspapers in cities not named Boston and New York cover what's happening in their cities and don't spend a lot of ink or pixels on East Coast news. Fine. That makes sense. But you'd think judging from the freak out going on in Boston that this story had captivated the nation. Uh, no. The KC Star in Kansas City is even better—the home page (again, the home page for the whole site) has a picture of Mike Vrabel and Matt Cassel arriving at Chiefs training camp. (Weird, huh, Pats fans?) There’s also a wrap-up of a Royals loss, a bunch more stuff on the Chiefs…and (I love this—this is absolutely great) a profile of one of the guys battling for the starting QB position at K-State this year. 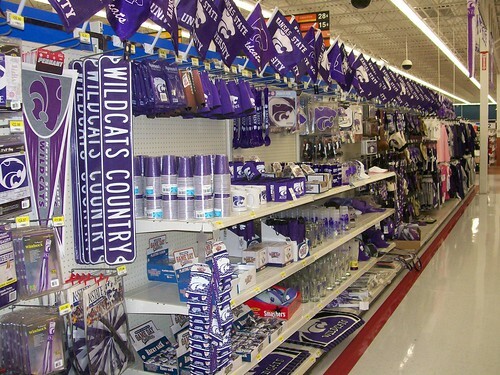 (Thank you, Middle America, for loving college football that much.) There is a link to an Ortiz story on the Star's sports page, but it gets pretty low billing. I took a spin around a few other sites and found basically the same thing--the nation yawns at steroids-in-baseball stories now. But what really makes me laugh is that Boston sports fans think that people in other parts of the country care about what happens in Boston sports. They think that, since 2004 (or even since 2001), the sports eyes of the nation have been on New England and haven't blinked. Yeah, not really. 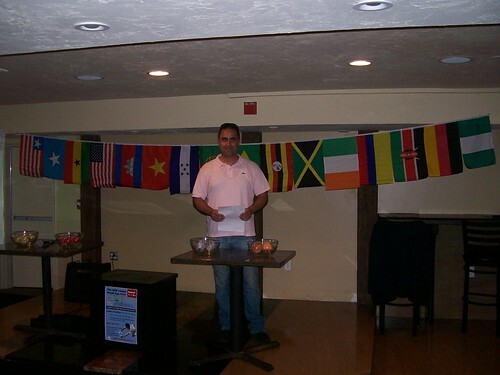 It's true that nearly a decade of unprecedented sports success has thrust Boston into the spotlight at times since 2001. And it's true that some of the more fantastic stories to come out of Boston--anything involving Bill Belichick, for instance--have grabbed the nation's attention and held it for a while. But, mostly, Boston sports fans have an inflated sense of their influence over fans in the rest of the country. They (we?) seem to think that the rest of the country is watching them all the time, judging them, envying them, waiting for bad things to happen to them. The fellowship of the miserable lives on, despite a lot of winning of late. Well, Boston fans, there's no need to worry. Nobody's going to judge you based on the news about Papi because nobody outside of Boston and New York (and maybe LA, with Manny involved) cares about it...or really about baseball, for that matter, but that's another post altogether. No, Boston, you're (we're) not constantly in the spotlight, and yes, Boston, everybody else's baseball players were juicing, too. So, calm down, take a stroll on a beautiful New England summer evening, grab a Smuttynose or maybe a Shipyard...and get over yourselves. Please. I've had a little catching up to do at work, and the concert last night took about 12 hours of time well spent. But the long-promised Ballpark Mini-Tour review is coming. I'll try to have it up sometime this week. 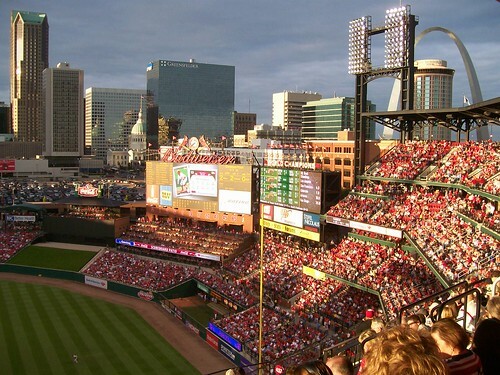 I'll be looking at Nationals Park in Washington, Busch Stadium in St. Louis and Kauffman Stadium in Kansas City. I'll also have a few thoughts on Boston's own Fenway Park. Warning, baseball purists--you're not going to like much of what I have to say. Beware. I don't really have enough superlatives to describe last night's show, which still has me shaking just a little bit. 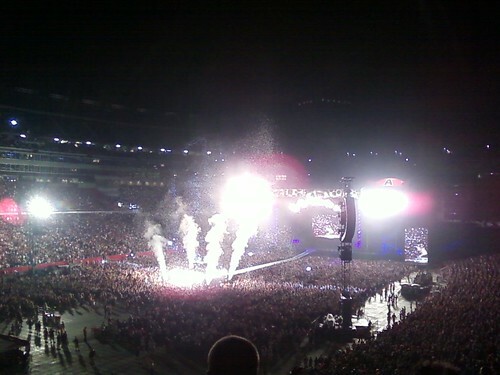 The Boston Globe, to its credit, produced a very good review that sums up pretty well my thoughts about the concert. Also, check out the Globe's small collection of reader comments on the AC/DC spectacular. This show is getting pretty much universal praise. Hopefully the youngsters out there who are trying to rock (if there still are any) will take a lesson from these guys. Keep it simple, keep it fun and never deviate from your roots. In-your-face, hard-driving rock 'n roll works every time, especially live. AC/DC doesn't get fancy and hasn't ever deviated into sappy ballads (hello, "November Rain") or stilted protest songs. I know what I'm going to get from AC/DC, and I know that I'm going to like it. I just hope that I get to see these guys again before their touring days are done. And Angus Young, please tell me how you do it. Your energy is amazing. I was physically whipped after just watching that show last night. I can't imagine what it must be like for Angus (who must be 50-something by now) to go out and put every last ounce of his being into every show, night after night. Simply amazing. AC/DC was awesome tonight a Gillette. That's all I really have the energy to say right now, at almost 3:30 am. I left the house at 3:45 on Tuesday afternoon and got home at 2:30 on Wednesday morning. And it was totally worth it. Foxborough, with tiny little Route 1 running through it, is still a ridiculous place to have a stadium, but maybe I'll rant about that later. For now, I'm still reveling in one of the greatest rock shows I've ever seen. If there is a more exhilarating moment in live performance than Angus Young cranking up the intro to "Thunderstruck," I haven't experienced it...and I don't want to because I might not survive it. For those about to rock, we salute you. For those about to go to bed, we hope you can get some sleep. Good night. The picture is a little fuzzy, but you get the idea. Driving through rural Kansas (in this case, from Washington to Manhattan) can be less than eventful. Still, Kansas is a surprisingly beautiful state. The Konza Prairie (pictured below) is legitimately gorgeous. 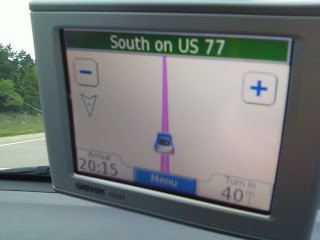 Thus far, I've been impressed with America's center-most state (of the lower 48, that is). 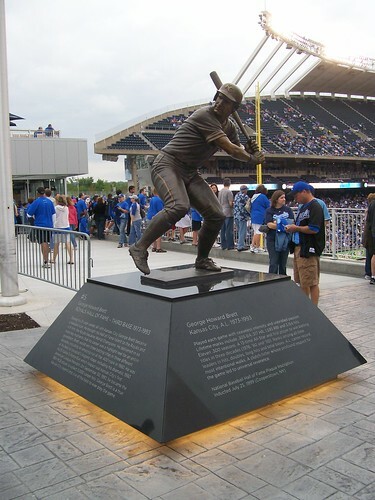 That's a statue of the great George Brett, of course, one of my favorite athletes of all time. Sadly, he couldn't help the Royals last night, as they got swept by the Angels at home. Nevertheless, the New K is a wonderful park, and KC fans are a lot of fun. One of these days--although it could be as late as next week, after I get home--I'll get the ballpark mini-tour ratings posted for your edification and comment. Here's a hint: KC is going to to very well...ballpark-wise, that is. 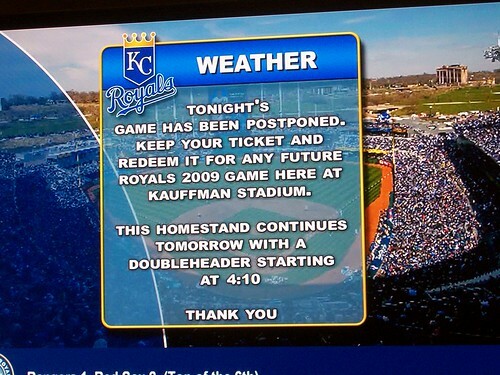 This put a bit of a crimp in my ballpark mini-tour, but I'm going to try to make it back to the New K for a game tonight. The park was great for hanging out in, though. The fans were friendly and fun-loving and kept a great spirit despite the fact that a steady rain fell for the two hours we were there and that it never looked likely that the game would even start...which it didn't. Thanks to some fortunate circumstances, this summer will afford me the opportunity to visit three "foreign" (as in non-Fenway) Major League ballparks. I went to Nationals Park back in June, and last night Busch Stadium was the lucky venue for my baseball-tourist visit. Monday night, I'll be at the New K in Kansas City, weather permitting (it's surprisingly chilly and cloudy here in the Midwest.) Once I've visited all three parks and have had time to digest my experiences, I'll post some personal ratings along with some photos. The older guy starts talking about latching onto the back of a car while riding a skateboard, and I blurt out, "Didn't Michael J. Fox do that in Back to the Future?" Of course, that movie is about 25 years old now...but, luckily for me, all the kids had seen it (and, yes, apparently he did do that in the movie). A bit later on, the girl starts talking about seeing some guy break another guy's arm in one of those "mixed martial arts" spectacles. She goes a bit into the martial arts moves the guy used, and I spit out, "Did he sweep the leg?" Blank stares. Karate Kid. Also about 25 years old now. From what I could tell, all three had sort of heard of it but hadn't seen it. This time, it was awkward. And then there was the discussion of how the girl, who lives in Rockford, Ill., met Rick Nielsen from Cheap Trick (excellent--a band I recognize and like) and got a guitar pick from him. (Cheap Trick, of course, hails from Rockford.) Now, I'm thinking of Mike Damone in Fast Times at Ridgemont High trying to sell a girl tickets to a Cheap Trick concert and saying, "What about the tunes? Mommy's alright, Daddy's alright, they just seem a little weird...the dream police na na na na na na na..." Fortunately, discretion got the better of me, and I let that 27-year-old movie reference rattle around in my brain without it coming out of my mouth. Of course, just prior to that, I had called Rockford "Rockville" (stone cold sober, I might add--maybe that was the problem) because I briefly got it mixed up with the town in that old REM song "Don't Go Back to Rockville." I said something about saying "Rockville" because of the old REM song and...you guessed it...blank stares. Ugh. They're great kids, all three of them, and we really had a nice conversation. I enjoyed their company immensely. But it was hard to not feel like their dad at times (especially since one of them is 13 and was born the year I graduated college). Stuff like this is happening to me more and more often, and I'm only 35. Alas. I either need to update my pop-culture references or just play the role of the goofy older guy when I'm around teens. I think the latter of those choices sounds like the wiser. Yeah, I signed up for Google AdSense tonight, so you'll start seeing an ad or ads showing up after some of the posts here. Hopefully the ads won't be too intrusive. I don't expect to actually make any money off of this blog. I am kind of curious about how this Internet-advertising thing works, though, so I figured the best way to learn about it would be to get some first-hand experience. And hey, if I do end up making a few bucks, great! Any little bit helps. If not, no big deal. I'm not about the money. I'm all about the writing, man...the writing! Labels: ads, blogging, this could be the start of something big, times are tough, Web sites, why? It is with a genuine sense of shame that I write that the day of glory has indeed arrived--and passed, actually--and I almost forgot about it. It's the very early morning of July 15 in Paris as I type this, so what we call Bastille Day here in the US is over in France. La Fete Nationale, or the national celebration, is France's July 4, although the history of it is far more complicated than our relatively simple story of the creation and signing of the Declaration of Independence. OK, I know that the French Revolution was a major turning point in the history of Western civilization. I get that. But Napoleon, a product of the revolution himself (and basically the father of modern France, even though he wasn't ethnically French), ended up crowning himself emperor and terrorizing Europe. So much for all that power-to-the-people stuff, then. The French are now on their fifth republic, the first four having collapsed in one way or another, usually quite tragically and spectacularly. But even though the original republic the French tried to establish after the revolution didn't take in the long run, at least there was gruesome violence and terror in the streets for a while there. Yay! Fireworks! Seriously, though, the occasion of Bastille Day--which, seriously, the French almost never call it--invites me to pontificate about a few things. Not that I need an invitation to do that, of course; anybody who has read this blog at all will realize that. Anyway, first off, American and British tourists, please stop asking where in Paris the Bastille--as in the actual structure that the revolutionaries stormed in 1789--is located. It's not there. Now, there is a Bastille Metro station, as well as an area known as Bastille, which is full of a lot of great bars, restaurants and clubs. It's a lot of fun, actually, and there's a big opera house there, too (not the famous one--the other one). There's also a huge monument that has nothing at all to do with the revolution (of course--what else would you expect?). The Bastille area is, in fact, where the Bastille prison used to be...a long time ago. But--and this is important--the Bastille itself isn't there anymore. It hasn't been for 220 years. It was demolished in 1789...at the outset of the revolution...after an angry mob stormed it, killed some guards and released the prisoners (months after, actually, but that's another story altogether). That's kind of what the whole Bastille Day celebration is about--the, uh, storming of the Bastille, which ended up being bad for the building's structural integrity. Or, at least, that explains why the national celebration in France happens on July 14. So, please, don't bug people in Paris by asking them how you can get to the Bastille. Visiting it would require time travel. That little tidbit aside, one of my favorite things about France came out of the revolution. (Well, more than one, I'm sure, but this is something I like in particular.) La Marseillaise, the French national anthem, was a bit of a war chant born during the revolution. It's mainly about the revolutionary French fighting Prussian and Austrian armies that were attacking France at the time, not so much about hacking off the king's head or putting Marie Antoinette (who really was so naive that she had no idea what was going on outside the palace in Versailles) to the blade. Eww! Yeah, and it actually gets worse. The song has many, many verses (the bit above is just the chorus), and some of them easily go beyond the PG-13 barrier. It's a bloody song about a bloody period in the history of a country that has a bloody past--even by European standards. But at the modern heart of it, July 14 isn't about terror or brutality or even really about the Bastille or the French Revolution. It's about being French and loving it, or at least it's about loving France. I do love France, usually. I mostly liked living there, and I liked visiting there again last summer. I still have some good friends there. I've had some great times there. I hope to have more. Oh, France has its (really big) problems and always has, but like July 4, July 14 is about celebrating a way of life. France is, after all, a nation that, through tumult, tragedy, many military defeats and even a few triumphs, has managed to give us andouillette sausage, Bordeaux and Burgundy wines, foie gras, and the finest pastries on earth. Now that's a country with its priorities straight. Seriously... Fireworks! And now, if you'll indulge me, I'll share a little Bastille Day nostalgia of my own. The July 14 parade in Paris is surprisingly military in nature, with all kinds of tanks and such barreling down the city's famous avenues. When I lived in Paris, I used to watch the military might of France go right by my apartment. I could stand on my balcony overlooking the Boulevard Pershing and get my own little private version of the parade, quieter and less crowded than the public one but honestly no less of a thrill for me. It was as if I had the French military on parade all to myself--and, yes, I know how many jokes that comment could spawn. But it really was pretty cool. It's hard for me to think sometimes that Paris used to be my daily life, that seeing the Arc de Triomphe--which wasn't far from where I lived--or the Eiffel Tower was routine (although I always made it a point to appreciate the beauty of Paris and never got tired of it), that I could stroll in the Luxembourg Gardens or sit in the lovely little Parc Monceau almost whenever I wanted...that I took out the garbage, showered, vacuumed, worked, ate, drank, cooked, walked, played rugby, slept, surfed the Web, argued, chatted and laughed in Paris because I lived there. All the time. Every day. Without thinking that I'd ever leave. But I did leave (now, that's a long story), and in the end, it was for the best. I'm happier now than I was then, and I do like living in Boston in general and in Waltham in particular. I have an incomparably wonderful wife and the best friends anybody could ever have. I have a job as a journalist, which is what I always wanted to be. My parents in Texas are no longer an 11-hour flight away. I have a great life. There are days, though, when I miss Paris dearly, when it seems almost incomprehensible that July 14 could have once again become just another Tuesday, as it was today. I didn't realize until about noon today that it was July 14, the day of la Fete Nationale. And that's why I'm rambling on in this post. I just wanted to celebrate a little bit. It may be July 15 in Paris by now, but for me, the day of glory has arrived--a bit late. And I'm just going to sit back, daydream, mull over some good memories and enjoy it for a while. C'est tout. Pity the poor Boston Globe--for as long as it's still with us. The boring broadsheet has produced what is mostly a weak Web site, with constant failed attempts at coming up with cute little slide shows or offbeat articles, most of which end up being way too...well, on beat, I suppose. Having said all that, I did find one of this week's gimmicks pretty cute. Apparently Michael Jackson's death has led to renewed interest in the old charity tune "We are the World." Well, this week, the Globe featured a fun little quiz, asking if readers could identify certain celebrities who took part in the famous recording of the song. 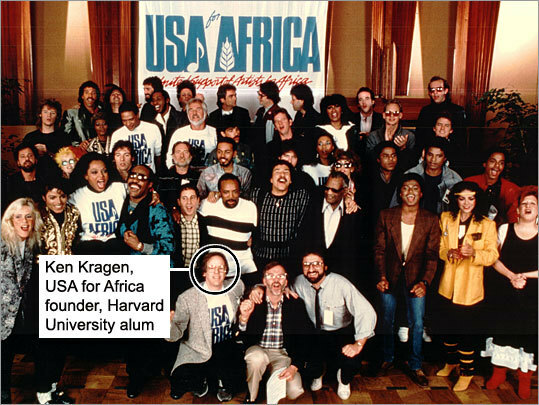 Given a distance of almost 25 years, some of the participants look a little less than familiar now (and a few are a lot less famous). Most people older than 30 will probably ace this little test...but I'm ashamed to admit that I misidentified a famous face or two. I won't tell you which ones they were. Anyway, well done to the Globe for actually sucking me in with a goofy Web vehicle for once. Anyway, I've got paragraph upon paragraph in me about Twitter, social networking, the downfall of journalism and deceased country-music stars (oh, it all comes together), but it's a beautiful Saturday afternoon in July, and I think I'll go for a bike ride rather than sit on the front porch and type. If you're really interested in news about Microsoft and the Microsoft channel (with, hopefully, a little humor and light entertainment thrown in), follow me on Twitter. If you're into technology news, it won't be boring. If you're not...well, it might be. I went to my first Red Sox game at Fenway in 1993 (a win over Detroit, but don't ask me the score--I'm not so much of a baseball fan that I can recall the details of games) and became a Red Sox fan that night. So, I'm no Pink Hat. I'm no 2004 bandwagoner, no fan who wasn't a fan until the Monster seats went up, no singer of the horrid "Sweet Caroline" during the eighth-inning stretch. I remember the playoff loss to Cleveland in 1995, Pedro getting revenge on the Indians in 1999, the inevitability of the '99 Yankees series and the pain of the 2003 Aaron Boone home run. I was living in France in 2004, but I was there, up early, before dawn, following the Yankees series and the World Series live online as best I could back then. Then again, I'm no Red Sox lifer, either. I cared nothing about the team until 1993. I cheered heartily for the Mets--my favorite team growing up, even though I come from Texas--in 1986. In fact, the 1986 World Series remains one of my all-time favorite sporting events. I don't remember 1967 at all, much less as a Red Sox fan living an Impossible Dream. Plus, I'm not that big a baseball fan. I like going to games and experiencing different parks, but I rarely watch baseball on TV, and I honesty kind of check out of baseball sometime in May and don't really check back in until September or maybe even October. I don't live and die with the Red Sox or any other team every day, all summer. So, keep all of that in mind as you read this. Sometime in the mid-'90s, I walked out of the Oak Grove T station in Melrose, Mass., and happened upon a kid who was collecting money for his little league baseball team. I dropped a dollar in his can and told him that if he practiced hard enough (what a completely patronizing and ridiculous thing this was to say--something a 55-year-old man would say, not a 20-something dude), he could become the next Nomar Garciaparra. He looked at me with a look of confusion. He had no idea who Nomar was. He would, I'm sure, not long after that. Nomar's first year as an all-star shortstop with the Sox was 1997, and as the team moved into consistent contention in the AL East, he became the mainstay of the franchise, "Nomah," the heir apparent to the throne of Williams and Yaz. He was the hope of the Fellowship of the Miserable, the guy who was going to lead what was becoming Red Sox Nation (a fairly genuine movement before it was a marketing slogan) to the promised land. In the long run, though, he ended up being the sacrificial lamb, the false messiah who left the team in a trade almost exactly five years ago and wasn't around when the Red Sox broke their 86-year hex by winning the 2004 World Series. Sometimes messiahs aren't really messiahs at all; they're just shortstops. Great shortstops, sure, but not much more than that. I never particularly liked Nomar, nor did I dislike him. I was fairly ambivalent toward the saviour who wasn't. But that's not the point of this post (and there will be one, eventually). When Nomar came back this week for what, incredibly, was his first trip to play at Fenway since he left the Sox, he brought back with him--for me, anyway--bittersweet memories of a long-gone era in Red Sox history. The bitter part of bittersweet is easy to understand--the losses to the Yankees, the playoff failures, the frustration of watching the evil empire from the Bronx dominate baseball again, the sense that the Sox would never quite get over that last hump...anybody who knew anything about baseball understood that stuff and knew why it hurt and annoyed and angered Boston fans. Fair enough. And it wasn't just all about 2004. It was about 2003, 2002, maybe even that 2001 team that ended up being a real drag. The feeling I miss was the hunger the fans had for victory, the hatred they had for the Yankees and the sense that this could be the year...! Wags used to say that the worst thing that could happen to Red Sox fans would be for the team to win the World Series, and that wasn't true. But it did change the way the fans lived each season. Now, every year is the year (as 2007 actually was, again) and every game is like a celebration of the fact that the Sox aren't eternally behind the Yankees anymore, that they're as good a team as baseball has produced this decade, that Boston isn't a city for losers and heart breakers anymore. And it's...boring. It's very boring. A few weeks ago, when I went to see the Sox play the Nationals at the marvelous Nationals Park, I found myself at Fenway South, full of Boston fans who hardly spoke to each other and walked around with a sense of contentment stemming from the fact that they'd all seen their team win the Series in their lifetimes. I cheered for the Sox, of course (and they lost), but I felt quite a bit of sympathy for the Nats and their fans, given that DC's multi-franchise history hasn't produced a champion since well before World War II. If I understood well enough the Steve Carell character and his analysis of Marcel Proust in Little Miss Sunshine (as you can tell, I'm quite literate--and the worst part is that I could actually read Proust in French if I wanted to), it's the suffering that makes the person, not the outcome. We are who we are because of all the lousy stuff we've been through, or something like that. Well, I'll extrapolate that to Red Sox fans. Yeah, it's better to be a fan now that the Sox have guaranteed us all good memories. But the thrill of the chase, the quest for alleviation of pain and frustration, the endless battle to finally conquer the Yankees--that stuff is gone, and it's not coming back. It's gone forever, and although I don't really want it to come back...I actually kind of do. The Red Sox now are just a team that wins a lot of games and has a big fan base. They're not that fundamentally different anymore from the late-'80s or early-'90s Twins (except that the Sox have more fans) or from the Cardinals of the '80s or the A's or Reds of the '70s. The drama is gone; the forlorn calls to WEEI are gone; the horrible Dan Shaugnessy columns that indulged in the Sox' plight are gone...and Nomar is gone. It's better this way. I know that. But it's kind of not...sometimes. Seeing Nomar stride around Fenway this week reminded me of how things used to be and how they'll never be again. Of course, there's always my first love in Boston sports, my unhealthy obsession for a decade-and-a-half and a team that's still a relative loser (although I think that it's getting better...). There's always...oh yes...undoubtedly...the Boston Bruins. But there will be many, many, many long, long, long posts on them to follow. Oh yes. Get ready. Hockey starts up again in the fall. Not soon enough. I know that FatMans My Kind of Town is out there reading, too, but since he's all freaky about privacy stuff (and probably for good reason), I won't mention him by name. But here's a shout out all the same...um, shout...out. A gentleman from a conservation society that works on the Anacostia River brought a rather imposing owl to the Red Sox-Nationals game at Nationals Park on June 25. I can't say that I've ever seen an owl at a ballpark before (although I've never been to a game at Rice...), but this one drew quite a lot of attention. Unfortunately, I've forgotten the name of the conservation society, but I'm sure it does valuable work. Our owl friend can probably attest to that...if he gives a hoot. Labels: baseball, birds, domestic travel, God bless America, random photo, sports, summer, why? My parents have mostly figured out the Internet, but it took them a while. Not so long ago, my dad used to complain about "e-mail people," or folks (like me, frankly) who preferred e-mail communication to picking up the phone for a chat. Also, it's easier to make excuses or communicate awkward messages over e-mail. "I was just really sick" or "I just got caught up at work" can sound (and be) so insincere voice-to-voice, but it's believable enough spelled out in pixels on a screen. Oh, and I shouldn't forget--I can't postpone a phone conversation while it's happening, but I can let an e-mail sit for days...weeks...months before responding to it. And, sadly, I often do. Eventually, though, I almost always respond, at least to personal e-mails--a very important point to make here. And if somebody I haven't heard from in ages e-mails me (which almost never happens anymore), I make a point of getting back to that person reasonably quickly. That's February 2009, for those keeping score. And that means that, for now and likely for the future, Facebook, Twitter, MySpace, LinkedIn and friends are downloads to e-mail's CDs, CD players to e-mail's cassettes, cassettes to e-mail's 8-tracks... You see where we're going with this. E-mail is out. And I'm now a Luddite. Where did I put that VCR? Oh, I'm on Facebook. I got on it in order to keep up with friends who...wouldn't keep up with me on e-mail. (This goes back to my point about responding via e-mail to friends I haven't heard from for a while...) And Facebook worked for that purpose. Which was great. Facebook also let me catch up with some folks I hadn't heard from or thought of in years...which has been a mixed bag at best. Some "friends" I was happy to catch up with again; others I would have preferred to have forgotten altogether. I've skipped MySpace, as most people older than 21 seem to these days, and I can't even begin to imagine Tweeting. I've got, as we'd say in Texas, a whole 'nother post coming up on Twitter (maybe two), which I'll get to one of these days when I'm in a really solid rant mode. I'm only in a casual rant mode tonight. Anyway, back to e-mail...or, more appropriately, not back to e-mail, since most people seem to have largely abandoned it for social purposes. I like e-mail. I like it because it's simple, direct and easy to manage. I like it because I know the protocol for it--there really isn't much of one. On Facebook especially, any message or "wall" posting seems to carry the urgency of a text or a phone call--people wonder what's wrong or why I'm being such a pill if I don't respond to their Facebook missives fairly quickly. With e-mail, as I've said before, pretty much anything goes (or went) in terms of response time. There's just more freedom with e-mail, or at least the perception of greater freedom. I also like e-mail because I can log into it without having to wade through fascinating blurbs of information about what color M&M some kid I went to junior high school with would be if, indeed, he could be an M&M. Oh, I know what you're thinking--it's easy enough just to skip the welcome screen and jump straight into Facebook e-mail. But with regular ol' e-mail, I don't have to skip the welcome page at all--or occasionally get caught up in reading it for longer than I'd like to admit. And e-mail's easier to read. All of this is probably making me sound like some sort of misanthrope or anti-social hermit, and I'm far from being either. I have friends--some real, some online, some on Facebook. I like spending time with them. I just don't like to have to be at an online party all the time in order to keep up with people I like. Fortunately, some of my better friends have resisted Facebook or are sticking mainly with communicating via e-mail. Hopefully they'll keep holding out. The other day, I sent an e-mail of a funny Daily Show clip (here it is) to a bunch of friends and got only one response. A friend--the one who responded by e-mail--posted the same video on Facebook and got tons of responses. Fair enough, maybe the friends I e-mailed were simply following the e-mail protocol I love so much and ignoring my e-mail or choosing not to respond (or respond after a long delay). That's fine...if that's the case. Labels: i can't believe you read the whole thing, leisure, netbooks, neurotic behavior, pop culture, reversal of fortune, the grass wasn't greener, Twitter, Web sites, what a shame, why?